OneNote Password 10.1.6805 is other software developed by LastBit Software. OneNote Password breaks passwords for password-protected MS OneNote (.one) files. OneNote password protection is based on strong crypto algorithms, so password recovery is a complex task. OneNote Password uses various recovery methods: Plain Dictionary and Hybrid Dictionary attacks, Brute-Force attacks, and Smart-Force (TM) attacks (this dramatically speeds up Brute-Force attacks). An easy-to-use Automatic Mode is also available. This is a demo version of the program. 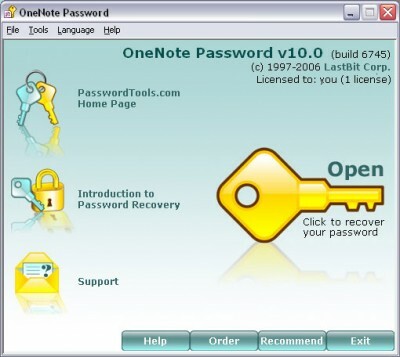 In order to use full version features, please go online and order a full version of OneNote Password 10.1.6805. The full version is available at regnow and LastBit Software website for $39.00. OneNote Password 10.1.6805 supports different languages (including English). It works with Windows 98/XP/Vista. We have tested OneNote Password 10.1.6805 for spyware and adware modules. The software is absolutely safe to install. Our website has thoroughly tested security & privacy product OneNote Password 10.1.6805, written the review and uploaded installation file (701K) to our fast server. Downloading OneNote Password 10.1.6805 will take several seconds if you use fast ADSL connection. Audit and recovery of Oracle Database passwords. PDF Password Cracker Professional edition allows to search for "owner"